I loved the Lacy Keyhole Scarf so much I decided to make another but in a more punchy color, right after finishing my first lacy keyhole scarf, because it was such a quick knit. 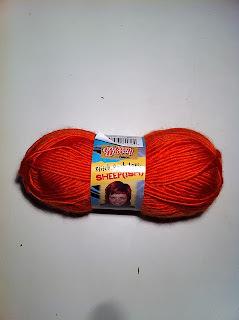 I used the Coral (ish) Sheepish yarn by Vickie Howell I have been calling it Orange. This yarn is more shiny and springy and I like how it drapes. I decided to keep this scarf and give the first keyhole scarf as a gift. I made a discovery today after blocking the Coral (ish) scarf, I decided to block and shape my previous scarfs too, the Wine Garter Stitch Scarf and the Royal Blue Diagonal Scarf. With all those colorful scarfs out, I had a WOW moment, I like colorful scarfs, my normal day to day wear has a high percent of black or grey, with a few tops and jackets to give me a pop of color. Now my scarf collection is included in that pop of color.